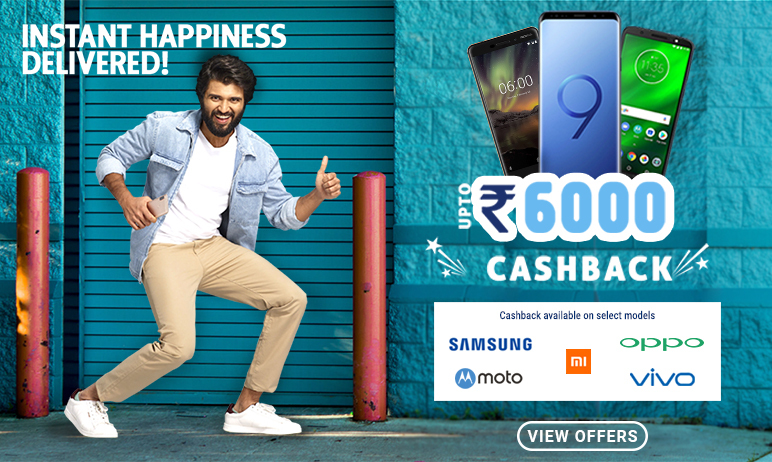 Get amazing Paytm Mall cashback on select mobiles phones on Samsung, Vivo, Xiaomi, Oppo and Motorola brands. Note: In case, your KYC is not updated, you will not be eligible for the cashback. Select any of the phones listed under this offer. Place the order with Pay On Delivery as the payment method. Our field executive will bring the product along with the Paytm QR to your delivery address. Once you scan the QR code through you Paytm Mall account, you will be guided by our executive to place the order successfully through your Paytm Mall account. You will also be given instructions to validate the IMEI code of your new mobile phone. Offer is valid on Pay On Delivery orders only. This offer is valid on select models only. To avail this offer customer should have activated KYC option on their Paytm account. In case of purchase under this offer through Paytm Mall, you will not be able to purchase any other mobile phone for a period of 45 days. Cashback will be credited to your Paytm account after 10 days from the date of delivery. Select your desired model and add to cart. Add your shipping details in the checkout step. Select pay on delivery at the checkout step 4. Our team will call you and authenticate your order. Product will be delivered by our Sangeetha Executive at your door step.